A little piece of me dies inside every time I stumble upon a beautiful piece of furniture that has been destroyed by the current owner. Since this problem seems all too common, I figured it only makes sense to begin a series on this blog post titled "Terrible Furniture" highlighting some of the worst postings on the Seattle Craigslist. Every angle shows a new imperfection in the finish. It looks wavy in some spots. Uneven in others. Awkwardly glossy. Fingerprints and smudge marks can't be missed. I can't imagine how many gallons of stripper one would need to purchase to remove this desk's unsightly finish coat. 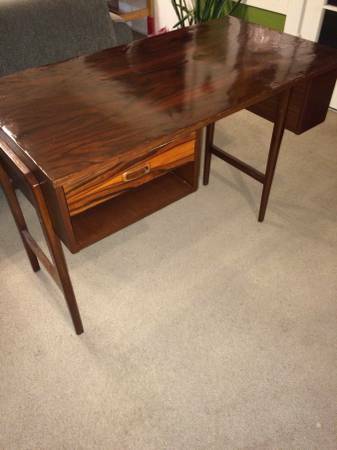 But hey, if you have $600 to spend, this rosewood desk that has been dunked in a hot tub of resin can be all yours.